It was a memorable and joyous spiritual season that we all enjoyed and benefited by celebrating the feast of our gracious, merciful and beautiful Vailankanni Arokia Madha, the Mother of God, at the Church of Resurrection from August 28 through September 5, 2015. Building on the great start we experienced last year, this year celebration included additional events, such as flag hoisting and fun activities, which brought our traditional experience right here to the Bay area. It was great feeling that Vailankanni Arokia Madha fame is getting spread in the Bay Area as we could witness the Church of Resurrection getting filled-up with large number of enthusiastic worshippers from variety of ethnic backgrounds. We first thank God for His Grace and Blessings on this festive occasion in honor of His Holy Mother and guiding all of us through this spiritual journey to be closer with Him and Mother Mary. 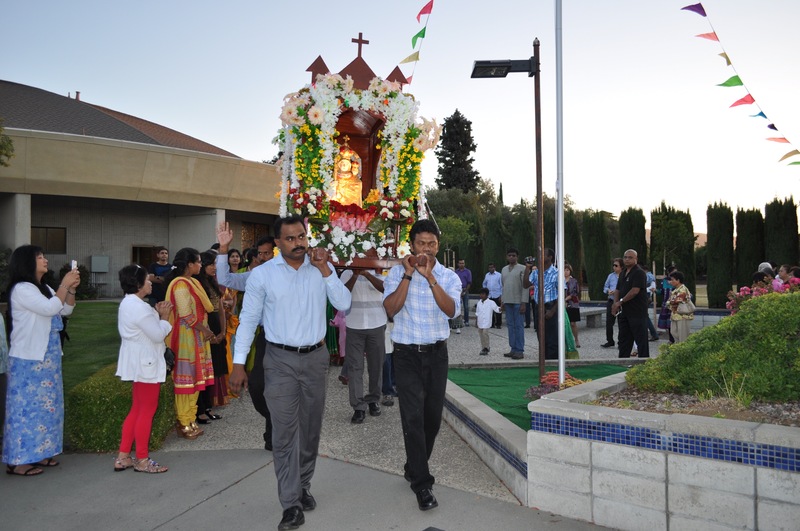 We thank from our heart the Church of Resurrection Parish and Diocese of San Jose for giving Sacred Heard Tamil Catholic Group all the support and guidance to help our community to grow spiritually and allow us to celebrate spiritual events in our traditional way, and this played a great role in the success of celebrating Vailankanni Arokia Madha feast. We thank Vicar General Rev. Msgr. 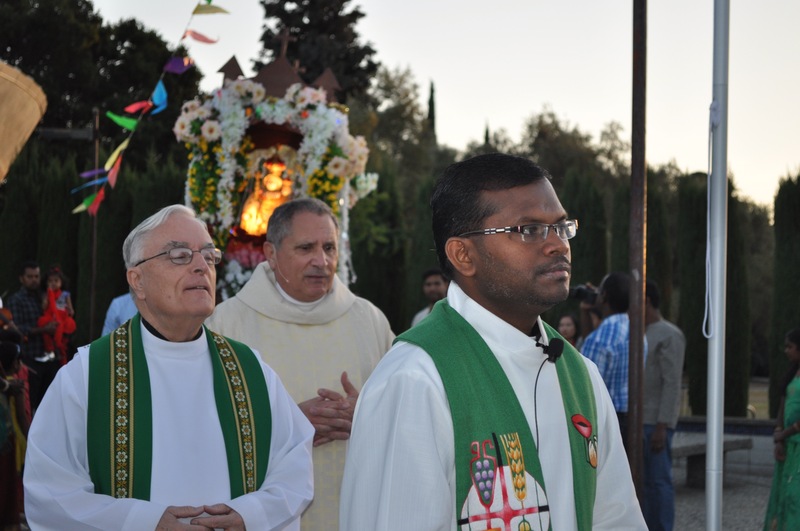 Francis V, Cilia for not only supporting us from the beginning, and also becoming friend of our community and our young children, and readily available, even in his busy schedule, to participate in the procession and celebrate the feast Mass to honor Vailankanni Arokia Madha. We thank the parish priest Fr. G. Robert Leger, and Rev. Fr. Phong Nguyen from Church of Resurrection for becoming part of us, inaugurating the feast season with flag hoisting, and celebrating the feast Mass. We thank Rev. Fr. Louis Leveil for being friend and spiritual guide to our community, and celebrating with us during the whole season starting with flag hoisting through celebrating feast Mass. We are thankful to God that our community has abundance of disciplined organizers, tireless volunteers and generous sponsors who continually support and help our community to grow spiritually and culturally, and they are the big part the great success we just experienced in celebrating Vailankanni Arokia Madha feast. For example, meticulously planning and executing all the events from start to finish, volunteering to take care of flag-hoisting, novena, decorating the stage and Madha carrier, choir, potlucks, pre-feast celebration, and feast day activities, and for generously sponsoring all the things needed for the celebration such as flag and flag pole, Mass books, decoration materials, gifts to Fathers, Statue stands, feast day dinner, and other invisible gifts. 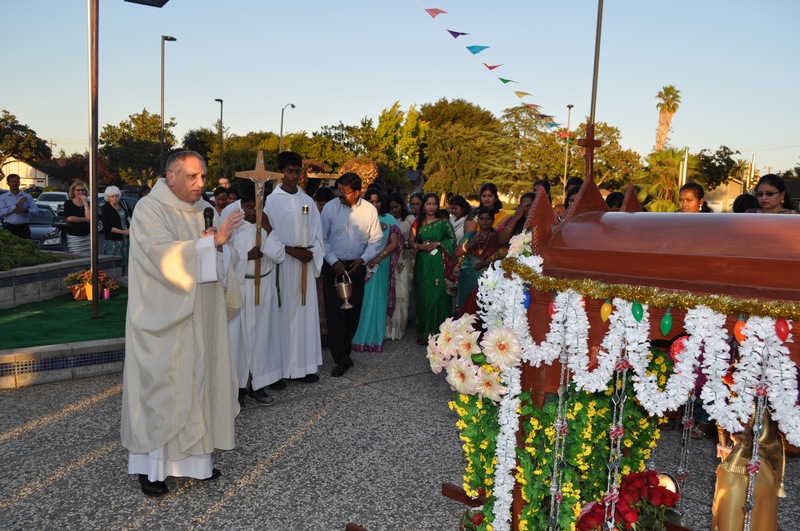 We are delighted that many people from multiple ethnic communities were able to join us on the Vailankanni Arokia Madha feast day, as evidenced by the rosary recite in multiple languages during the solemn procession, filled-up Church of Resurrection during the feast Mass, and prayer petition in multiple languages during the feast Mass. Our community welcomes all who newly participated in this celebration. The feast season was inaugurated by Rev. Fr. G. Robert Leger by blessing the flag and hoisting the flag on the evening of Friday, Aug 28, 2015. Flag hoisting was preceded by the first Novena for the Vailankanni Arokia Madha. Rev. Fr. Louis Leveil delighted us by joining us in the inauguration with his friends Rev. Fr. Kennedy and Rev. Fr. John Bosco. The inauguration event was concluded with potluck dinner. Although it was a week-day, it was delightful to see many Madha devotees overwhelmingly participated in this event and in the potlucks, and made it a great success. Many who attended have provided the feedback that it was a very spiritually touching experience honoring our Vailankanni Arokia Madha. Pre-feast day (September 04, 2015) started with Vailankanni Arokia Madha Novena, and followed with kids dance and the skit performed by children and adults. The skit performance helped to reveal the miracles of the Mother and it was great way to introduce our Lady of Vailankanni to our children. The kid’s events were followed with potluck dinner, which again enthusiastically participated by many. The potluck was followed with Pattimandram (debate), performed by 2 teams of 4 adults on each team, and the topic was “For prayer life, technology is padikkal (helpful) or, thadaikal (obstruction)” and it was mediated by Rev. Fr. Louis Leveil, and the audience included Rev. Fr. Kennedy and Rev. Fr. John Bosco. The Feast day (September 05, 2015) started with fun and feast-preparation activities in the morning. In the evening around 7.00 PM, Vicar General blessed the Madha’s image in the carrier, and this was followed with the feast day novena for the the Mother. Immediately after, the solemn procession started - lead by the Altar servers, children, Vicar General joined by priests, Fr. G. Robert Leger, Rev. Fr. Phong Nguyen, and Rev. Fr. Louis Leveil. It was great to see lot of people joining the procession, lining-up behind and front of the decorated Mother Mary, carrier carried by men, reciting the rosaries in multiple languages. The procession took the same route as the last year celebration — started from the side of the church, proceeded along the pathway towards Farana Center, crossed the church parking lot to continue along the walkway on the side of “Hollenbeck Ave” bordering the church campus and finally entered in front of the church where the big charismatic statue of the resurrected Jesus located, and the Velankanni Matha statue in the carrier was placed in front the statue of resurrected Jesus for the final prayers and blessings. It was a spiritually fulfilling moment for all who were present in this extra-ordinary setting as it reminded us all that Christ from the cross offered His Mother as our mother. Once the procession was over, Vailankanni Arokia Madha statue was brought inside the church, and the Holy Mass started. The Holy Mass was celebrated by Vicar General, Fr. G. Robert Leger, Rev. Fr. Phong Nguyen, and Rev. Fr. Louis Leveil. 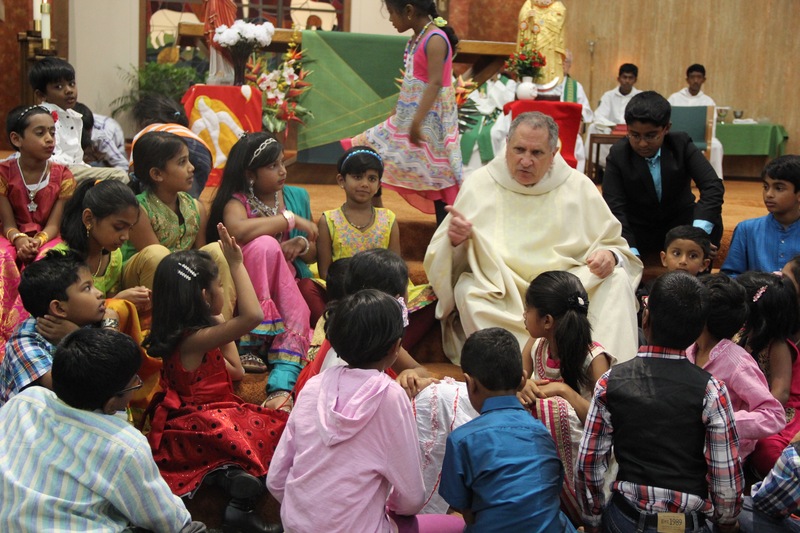 During the homily time, Vicar General continued his tradition of inviting all children to Altar to sit around him to explore the background around the feast and various other spiritual matters. 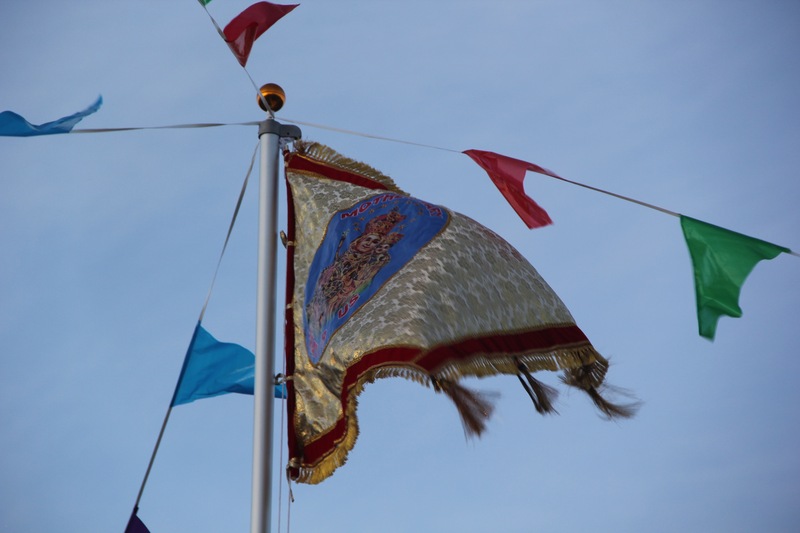 After the Mass ended, all four Fathers and people proceeded to outside of the church to participate in the ceremony of lowering the Velankanni Madha flag. After the prayers, Vicar General lowered the flag, and people proceeded to Farana center for fellowship, dinner and photos which concluded the feast. Special thanks to Victor - please visit our Facebook page to see the pictures of this wonderful celebration. We look forward to another great year of Our Lady of Vailankanni's festival celebration next year.